The Tintagel Arms Hotel dating back to around 1750 is set in one of the most breathtaking locations in Cornwall, Lee and Sharon welcome locals and travellers alike and pride ourselves in our friendly warm welcome. We hope that our website will answer all your questions about our character Inn based in the historic and somewhat mysterious village of Tintagel, rumoured to be the Camelot of Arthurian legend. 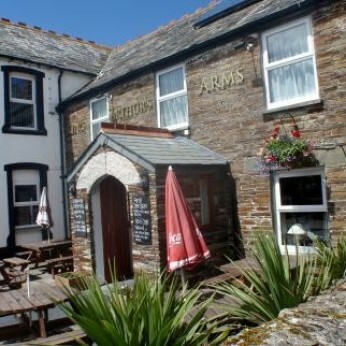 At the Tintagel Arms we offer quality B&B and self catering accommodation where you can enjoy a great selection of local Cornish real ales, beers, wines, spirits, soft drinks and hot drinks in a comfortable and cosy pub atmosphere. Our freshly cooked, homemade food is served all day until 9pm at night and includes breakfast, cream teas and a specials board featuring our team of chefs’ specials of the day including local fish dishes. North Cornwall's mild climate, distinct cultural identity and gorgeous countryside have made it one of the most popular holiday destinations in Southern England. So why not come and stay at the Tintagel Arms Hotel for a relaxing break and explore the delightful rugged coastline of North Cornwall.